Here’s some perspective: history, demand and supply. 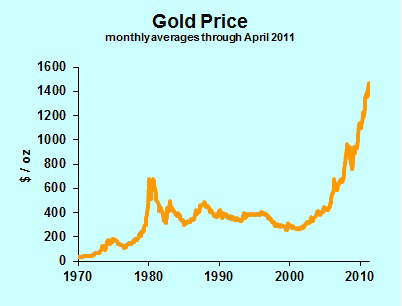 Brief history of gold price: Gold had sold for $35 an ounce, then shot up to $675 during the last bubble, peaking in January 1980. (I’m using monthly averages throughout this article.) That’s cool, buying at $25 and selling at $675. However, as gold was shooting up, plenty of new “investors” were buying, and there were plenty of people who got in on the boom at above $600. Now we’re up over $1500 an ounce (I’m writing on April 28, 2011). Isn’t that great? Let’s stay with the history for a bit. Let’s go back and adjust that 1980 peak for inflation. In terms of dollars with 2010 purchasing power, that peak was $1,892 per ounce. Another 23 percent upward and those old investors will have recovered all their purchasing power. Whoop de do. Just for comparison, if you had bought stocks in January 1980, you would have a total inflation-adjusted return of 316 percent. But we were headed into a recession in 1980, with fed funds at 13.8 percent, mortgages at 12.8 percent, and everyone knew it was an awful time to buy stock. Demand for Gold: The big surge in gold demand recently has been speculative, but first let’s cover usage. Jewelry is a major use, and the expanding economy in the emerging world is stimulating demand. There’s plenty of industrial use of gold. Your computer has gold connections, but not enough to melt down your box and turn a profit. However, we have a lot more electronic stuff than every before, and industrial usage is rising. Gold is also used in dentistry, and I would expect rising incomes in the third world to stimulate demand for gold fillings. There are other industrial uses which should rise with the world economy. The speculative demand for gold has historically been fueled by inflation fears. The tremendous monetary stimulus of the Federal Reserve warrants some concern. However, here in the United States we have so much unused productive capacity that I can’t see inflation emerging anytime soon. Further, one would want to look at worldwide monetary policy, which is not nearly as stimulative as U.S. policy. Supply of Gold: In the short-run, it’s hard to increase gold production. Mines are capital intensive businesses. The existing mines may be able to run double shifts and increase output, but adding capacity takes time. However, high prices for gold motivate mining companies to ramp up production. The first key thought is that we have a large number of gold mines out there. A typical mine has a variety of mineral combinations in different locations. The mining geologists know that the high-concentration (equal low cost production) ore is over here, while the low-concentration ore (high production cost) is over there. They will sometimes shift production back and forth to keep their workers fully employed. At times like these, though, look for every operating mine to produce at maximum capacity. In addition, prospectors are staking out claims to new fields, as the Wall Street Journal reported today. Supply will increase substantially, but with a long time lag. What happened after that 1980 price spike? It took several years for production to increase, and then it zoomed. And stayed high even as prices were plummeting. (Statistics here) That’s what happens in a capital intensive business. A company says, “At $600 an ounce we can make a lot of money. We invest a bazillion dollars upfront, and then we can mine gold for only $200 an ounce.” By the time the mine is operating, gold is down to $300 an ounce. It turns out the bazillion dollars of upfront expense are not justified by the production economics, but the mine continues to operate because it’s covering its variable costs. (This might be a good time to review the microeconomics of fixed costs and variable costs.) The bottom line: once production increases, it stays high for years to come. Forecast of Gold Prices: It’s hard to predict exactly when the price of gold will start to decline, but it will come down. And when it turns, it is likely to turn very sharply down, then remain depressed for at least a decade. Dr. Bill Conerly is the consultant who connects the dots between the economy and business decisions. He holds a Ph.D. in economics from Duke University and was formerly Senior Vice President at First Interstate Bank. Dr. Conerly is author of Businomics: From the Headlines to Your Bottomline—How to Profit in Any Economic Cycle (http://www.businomics.com), which provides business leaders with a framework for understanding current economic news. He is co-author of Thinking Economics, a multi-media high school economics curriculum used in 24 states. Dr. Conerly has been interviewed on the News Hour with Jim Lehrer, CNN and local television and radio stations across the country. He has been quoted in ...More the Wall Street Journal, Fortune Magazine, and USA Today. Dr. Conerly is chairman of the board of Cascade Policy Institute, a member of Oregon Governor Ted Kulongoski’s Council of Economic Advisors, and a Senior Fellow at the National Center for Policy Analysis. Another Fear mongering website. Why don’t you compare Gold to the value of the dollar you coward. Great Article. The data references are particularly helpful.